With help from the Newton Police Department, the bear was successfully immobilized by the Mass. Environmental Police. After a brief highway shutdown, a young black bear that turned up in Newton was captured by authorities Wednesday night and taken to an animal hospital, according to the Massachusetts Environmental Police. The bear had injuries that veterinarians suspected could have been caused by being hit by a car and had to be euthanized, officials said. Environmental Police were notified about 6:40 p.m. that the bear had been sighted alongside Route 9, according to a statement from Katie Gronendyke, a spokeswoman for the agency. Because the surrounding area is heavily populated, Environmental Police trained in chemically immobilizing animals worked with Newton officers to capture the bear, which weighed about 85 to 110 pounds and was estimated to be about 2 years old, Gronendyke said. A section of Route 9 was briefly closed to traffic while the bear was captured, she said. Because of the bear’s youth, it was taken to the Tufts Wildlife Clinic in North Grafton, she said. “A comprehensive physical exam, including radiographs, revealed multiple fractures as well as other wounds, which veterinarians suspect could have been caused by a motor vehicle collision. In consultation with [state wildlife officials], it was determined that rehabilitation would not be possible, so the difficult decision was made to euthanize the bear,” according to a statement from Taraneh Pettinato, a spokeswoman for Tufts University’s Cummings School of Veterinary Medicine. 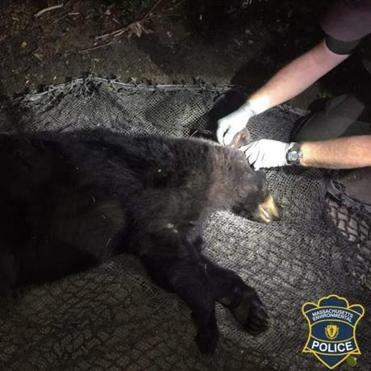 The captured bear was almost certainly the one seen Tuesday night in a tree near 1320 Centre St. near the Green Line tracks, said Dave Wattles, a black bear and furbearer biologist with the Massachusetts Division of Fisheries and Wildlife. “I’m highly confident that it’s the same bear,” he said. While bears have been seen in other nearby communities such as Framingham as recently as Tuesday, as well as in Manchester, N.H., about a week earlier and in a residential section of Bedford, N.H., last month, this is “the first one in a while” to appear inside Route 128, Wattles said. There have been numerous reports of bears in the belt between Route 128 and Interstate 495, Wattles said, which appears to be the home range for a relatively small number of the creatures. He said the young bear in Newton was probably looking for a territory where it would not have to compete with dominant, mature males. Residents finding bears in their neighborhoods should keep their distance, he said. “It is a large, wild animal. One of the most important things is to give it space. . . . Don’t try to get closer to get a picture. Don’t pursue an animal,” Wattles said. Such encounters can drive the bears further into developed areas, complicating life for the animal and the humans around it. Bears wander into areas populated by people largely because they are seeking food, he said, so the best way to keep them out is to not provide snacks by placing bird feeders outside, feeding pets in the yard, or otherwise making tasty morsels available. “If [people] don’t want bears in their neighborhoods, they don’t want them in their yards, they have to remove all food sources,” he said. He said “hobby farmers” raising chickens or maintaining beehives in their yards should install electric fencing — the only reliable way to keep bears away. Wattles added that bears are “not inherently aggressive toward people, so just the mere presence isn’t an immediate threat toward people,” but he cautioned that having bears in close proximity to people increases the chances of a dangerous interaction. There is more information about bears in Massachusetts at mass.gov/bears.